The Japanese flag is rich in history and culture. It is legend that its origins go as far back as the 13th century during the Mongol invasions of Japan, when a Buddhist monk gave a sun disc flag to the emperor who was believed to be the descendent of the sun goddess Amaterasu. The sun symbol contained in the flag has been the state symbol of Japan for centuries and has even been seen on folding fans of samurais from the 12th century. 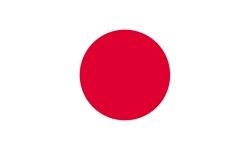 The Japanese flag is called “Hinomaru” or sun disc. The colors on the Japanese flag also have deep meaning; the red on the flag represents strength, bravery and Valor and the White Represents peace and Honesty. The Japanese flag was created in 1870 and while the symbol itself might be centuries old the current flag was not officially adopted as the national flag until August 13th 1999.